Isn’t Lewis cute? This guy enjoys posing for pics! What do bloggers do when they meet? Well, they eat, drink, talk and have a ball – especially when they happen to land at the same RV park! And that’s exactly what we have been doing here. 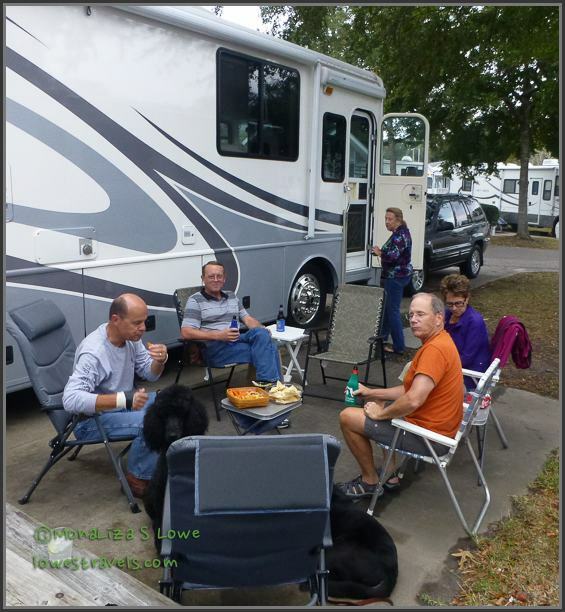 Heading toward North Myrtle Beach, we learned that Dave and Sue of Beluga’s Excellent Adventures were already settled in at Briarcliff RV Campground. Then we discovered that John and Pam of Oh the Places would be arriving at the same campground the day after we got there. None of us planned it that way, it just happened! Following each other’s blogs helped us to track our movements, and – viola! – we all ended up here at the same time. Now, how cool is that? Happy Hour at John and Pam’s site (John and Pam on the right). 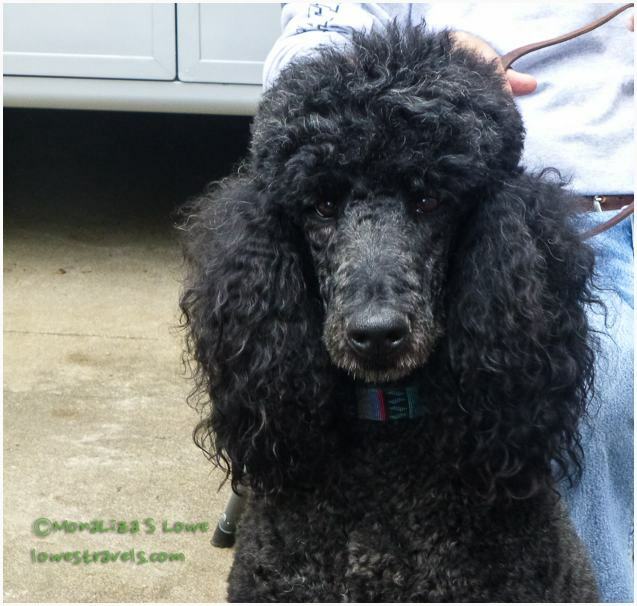 This was our first time meeting Dave and Sue, and their very well-behaved black beauties, Lewis and Sasha. We had met John and Pam earlier this summer at Lake Erie, NY. Both couples have been on the road longer than us and had lots of stories to tell and experiences to share. There were a lot of laughs as we got caught up on our adventures. …and dinner in the evening at the excellent restaurants that were just a short walk away. All we needed were hungry tummies and the gate combination – “lower, middle, top”, according to Dave. We had themed dinners – seafood night first, then Italian and finally pizza. I forgot to bring my camera to our unexpected family-style Italian dinner. That doesn’t happen very often! Pizza night, and we were happy to have leftovers of this pizza! Each night, Steve and I arrived home with full tummies – oink, oink! We don’t normally go out for dinner so often, but we had a blast enjoying good meals with our friends at these excellent restaurants. 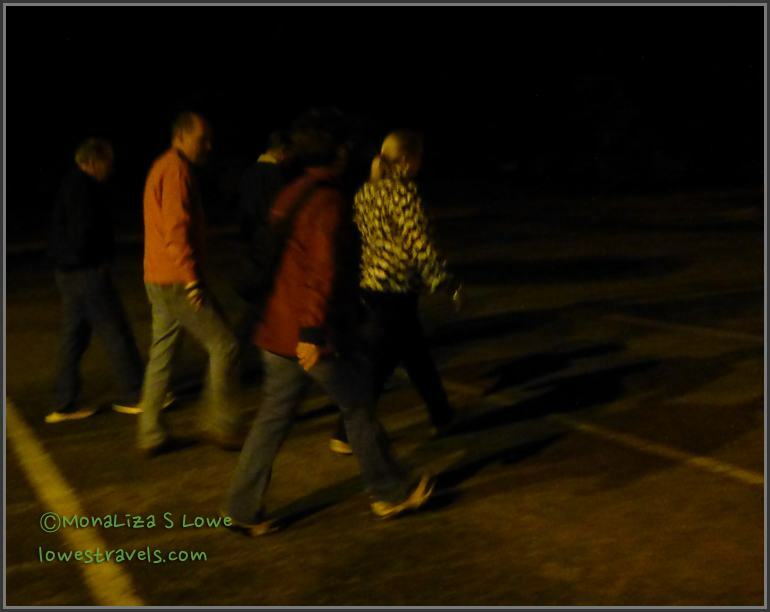 Hungry travel warriors heading out for pizza – don’t get in our way! 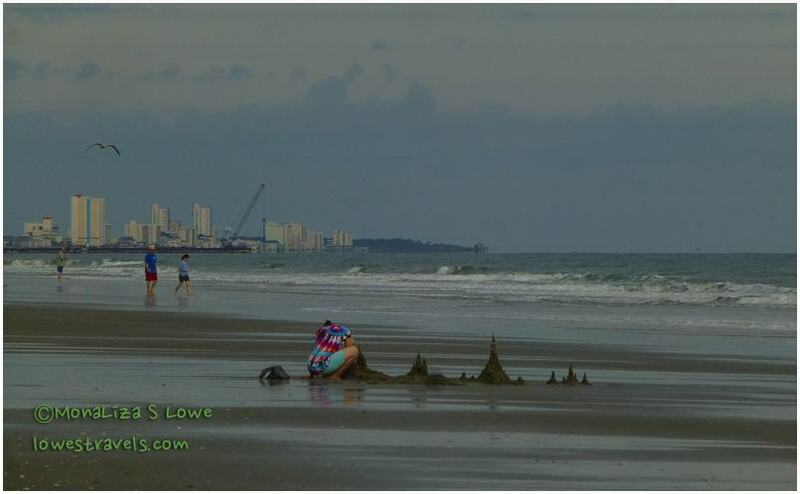 Just like the Outer Banks in North Carolina, Myrtle Beach is pretty quiet this time of the year. And to quote one of the servers we talked with, “it’s boring here now”. Wasn’t a problem for us! Unlike at the OBX, we had to drive just over a mile to access the beach here. But parking wasn’t an issue, and it was free. So, we made the most of our time, hanging out at the beach whenever the weather permitted. Each stop on our way south is getting a little warmer – in about 500 miles we should be down to shorts and tank tops every day – yay! I want to take a moment to thank all of you who have asked about my family in the Philippines after Super Typhoon Haiyan devastated my country. Mom and the rest of my family in Cebu are safe and out of danger. However, as of this post we are still unable to contact my nieces and nephews who live in the province of Leyte, which bore the brunt of the powerful storm. We’re praying for them as we wait for communications to come back up. Update: As of today Nov 11, the fourth day after the storm we finally heard from my nieces and nephews. They are all alive, safe but are now homeless. Thank you all for your thoughts and prayers. Next up: Charleston, here we come! Thank you for the update on your family. Chuck and I have been thinking of you and yours daily and hoping for the best. It is a terrible thing to watch. It looks to be a wider impact area than Katrina which was truly horrifying. 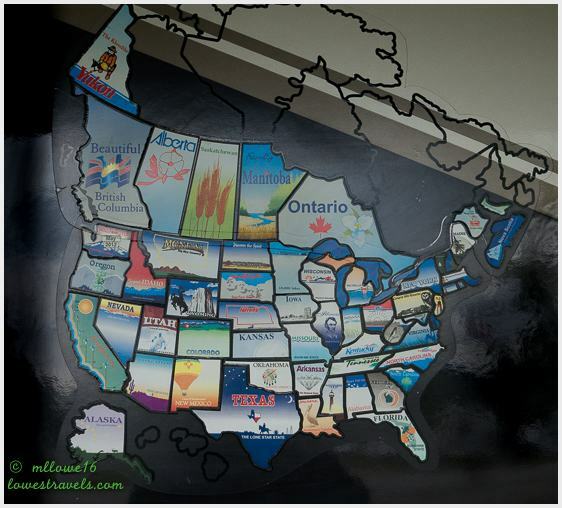 Your east coast journeys have been great to follow – hopefully we will be in your footsteps in a year or two. We are just now on our first day of travel from Santa Fe to points southwest. Thank you so much Ayn. We are very thankful they are now out of the devastated area. I would urge you to swing by the east coast, there are really lots to see here. 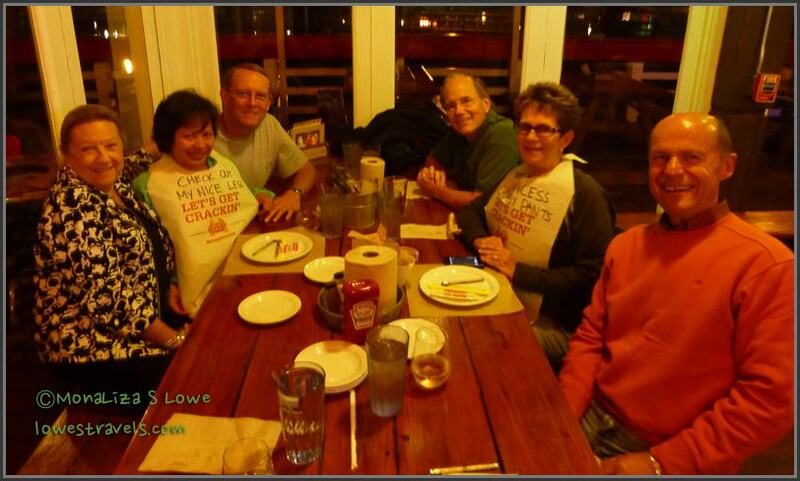 We should meet up again in 2014, we will be in TX next winter. Seems like your bellies full of food and laughter. 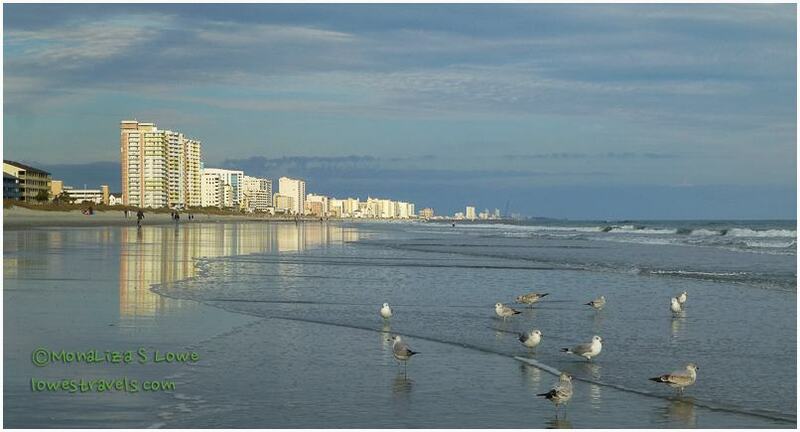 The view with the gulls and the city reminds me so much of my picture I took from Black’s Beach in SD. I’m hoping that my company sends me to Philippines as disaster relief responder. They are gearing up as well as I do in case we got asked to go there. If not, We are also fixing to have a donation box so people can give old clothes, shoes or anything they want to donate. I sure hope you get assigned back there, for it is very disheartening to watch. Thank you for all the donation, every little help can save a life. Good to hear that your family is safe!! Thanks Mahesh, they are now in Cebu away from the devastation. So happy to hear your family is ok. Such a tragic storm. Very sad and tragic indeed. Thank you so much for your thoughts. Wonderful beach shots Mona Liza. And I love the pictures at dinner! So glad to hear the good news about your family…thoughts and prayers for everyone there. We should be meeting up somewhere sometime before our next gig up north. Hoping your nieces and nephews are safe and praying for everyone there. We were in MB this time about three years back. We really liked it. What a beautiful beach. We were some of the only fools playing in the waves but back home in Nevada, 70 degrees was just a memory. But we had a warm room to go back to right on the beach so it wasn’t too bad. Safe travels! We appreciate your prayers, my nieces and nephews are all accounted for and now in Cebu. We luck out, the beach is almost empty and we love it! ML & Steve, know that you are in our thoughts…. we are so very sorry about the devastation and loss of life. I can only cry. Thank you Maureen, watching the horror on tv and listening to my nieces recount of their ordeal is depressing. They are all fine and accounted for and out of Tacloban. ML That is so good to hear that they are all ok. Unimaginable horror they survived…. Hope you and Steve are doing well. 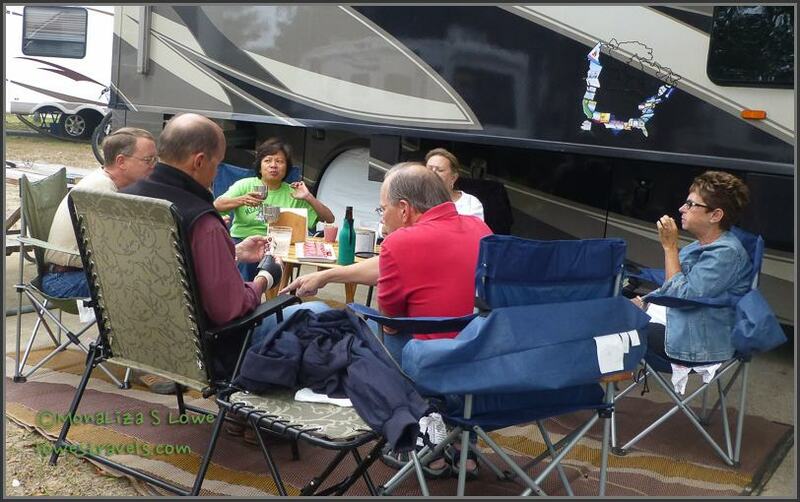 True, meeting RV blog friends is fun and exciting and the sharing is amazing. Fortunately, despite late contact my nieces and nephews are all fine and out of Tacloban. Thank you so much for your wishes. Thank you for the update, and I hope and pray that they are safe and sound and well cared for. Best wishes for the safety of your nieces and nephews. 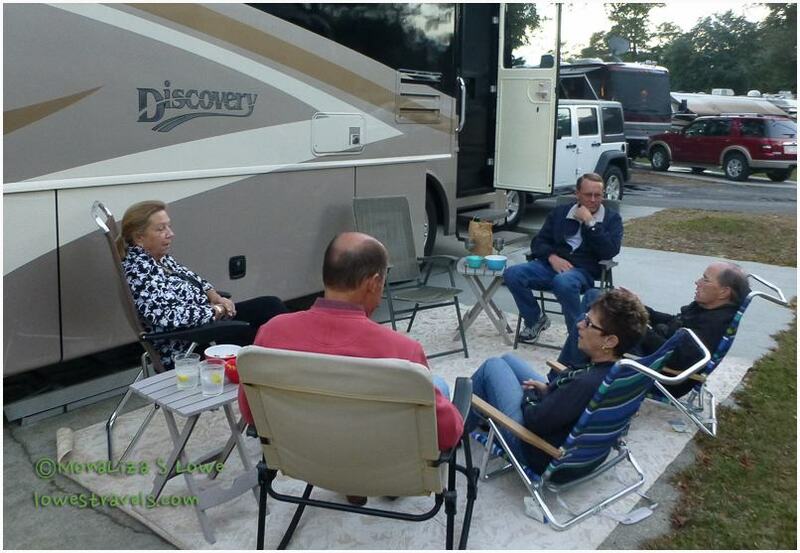 I think it is so neat to read of so many bloggers meeting in person at an RV park!! It sounds like you are all having an excellent time. Wonderful news about your family in Cebu. We will be praying that your family members fare as well. So happy you got to meet with 2 of my favorite bloggers! 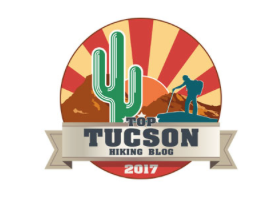 Really fun to read all your blogs of the event. Thank goodness your family in Cebu is ok and wishing the other family members well also. Nice to see everyone having such a good time. We enjoyed our Lake Havasu visit so much…. 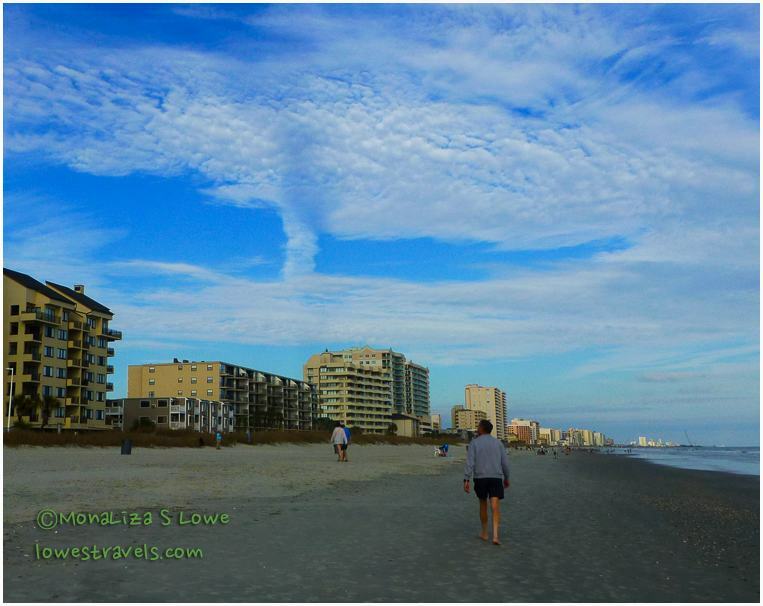 that and your beach photos have me looking forward to my Gulf visit in Jan.
Good to read your recap of Myrtle Beach, our thoughts exactly! It was so nice meeting and spending time with you and look forward to seeing you once again in Charleston. This campground is pleasant, we’re glad we chose it, great minds think alike, eh? Our thoughts go out to your family and hope you’ll hear from them very soon. 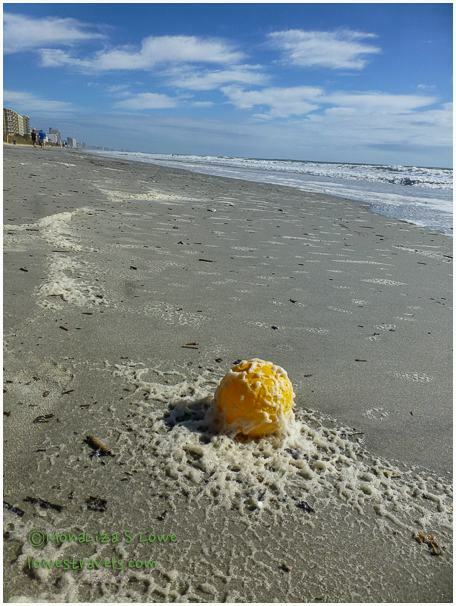 You have some beautiful photos of the beach. Your new header is wonderful…love the reflection!! Thanks for the updates on your family both here and on FB. Praying all is well with the rest of your family. The devastation is unbelievable.